It’s almost September, so we’ll be having breakfast at Hangar S12 on Saturday, starting at 08:00. The Tehama County Aviation Association is once again sponsoring their End of Summer Fly-In Cruise-In at the Red Bluff Airport, this year on Saturday, September 23rd. Here’s the flyer. VIP Notice – Reno, NV. Notice: Expect VIP movement August 26-27, 2017 in the vicinity of Reno, NV. Pilots can expect airspace restrictions in conjunction with this VIP movement. The FAA recommends that all aircraft operators check NOTAMs OFTEN for mandatory airspace restrictions prior to operations within this region. The 2017 Poker Run is on October 14th, and pre-registration is now open! Notice: Expect VIP movement August 23, 2017 in the vicinity of Reno, NV. Pilots can expect airspace restrictions in conjunction with this VIP movement. The FAA recommends that all aircraft operators check NOTAMs OFTEN for mandatory airspace restrictions prior to operations within this region. On August 26th, we’ll have breakfast from 08:00, and then we’ll have a program presented by Bruce Estes – The Basics of Foreflight. Are You Flying to the Eclipse Path? Do you plan to fly your aircraft on August 21 during the solar eclipse? If yes, you’re not alone. Several airports located in the path of the eclipse have notified the FAA that they are anticipating a significant increase in air traffic before and during the eclipse. Many of these airports are non-towered and have limited capacity to accommodate an increase in traffic. Here are some tips to fly safe in the path of the eclipse. Use US Chart Supplements (formerly AFD). Check NOTAMs for your departing and arriving airports, including airports along the route of your flight. Remember, some airports may already be at capacity. Call your destination airport, and respect the runway closures and safety information they provide. Expect Unicom congestion, and check for additional instructions on ASOS/AWOS voice over. See and Avoid is a high priority. Watch out for possible drone activity. Utilize Air Traffic Services when available. 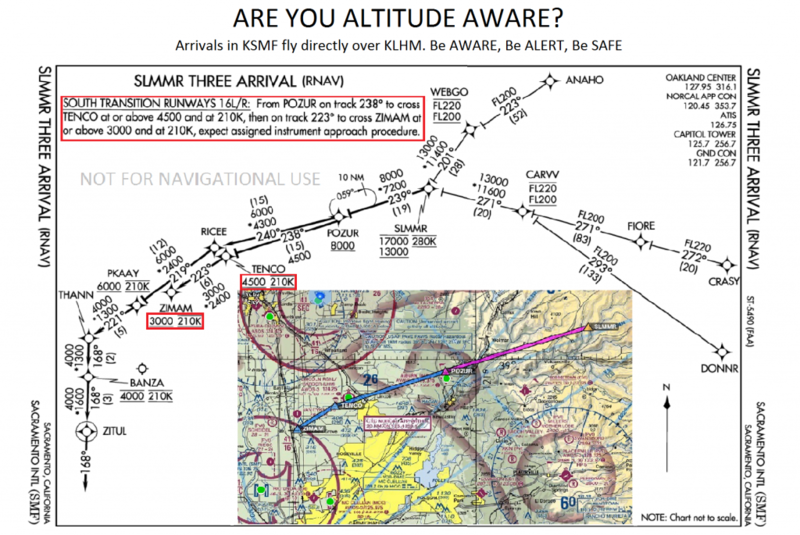 Use IFR operations when appropriate, file VFR flight plans …. let Air Traffic assist you! This is some info on the SMF arrivals from the East that overfly KLHM. Note that they may fly a 4,500 over KLHM and can descend to 3,000 at the edge of the class C.
August 16th is the membership meeting, at 18:00 at the ‘The Old Spaghetti Factory‘, 731 Sunrise Blvd, Roseville. 3 course: Salad, bread, entree, spumoni ice cream. Prices include tax and tip. Spaghetti with tomato sauce, $ 13.60. Please be prepared to pay with cash or check. [ no credit cards please. ] – all drinks are separate. Bruce Estes will present about his recent trip to this year’s Oshkosh. This will be a hands on opportunity to explore how your computer and your tablet can be used for basic flight planning, weather and NOTAM information, weight and balance, flight plan creation and filing, and integration in the cockpit with a tablet.